Exciting news, folks! There’s something new coming to my blog this week! A little while ago, Trim Healthy Mama graciously shared one of my more “involved”, special-occasion recipes on their Facebook page. Unfortunately, most of the comments it received had to do with the length of the ingredients list. What can one do with criticism other than learn from it? Therefore, I decided to post a bunch of my favorite 5- (or fewer) ingredient recipes this week. This week I’m doing snacks and drinks, next week I’ll post two “normal” recipes, and the week after that I’m going to be posting some 5-ingredient meal and dessert recipes. Sound fun? I hope so, because I’m doing this for you guys. OK, OK, so I had fun too… I’ll be posting 5 new 5-ingredient recipes this week, and Saturday I’ll be doing a round-up post of these new recipes, some 5-ingredient snack and drink recipes I’ve posted previously, as well as some easy recipes I got from my blogging buddies. Stay tuned, and be sure to sign up for e-mail updates, like my Facebook page, and/or follow me on Pinterest so you can keep up with the action! 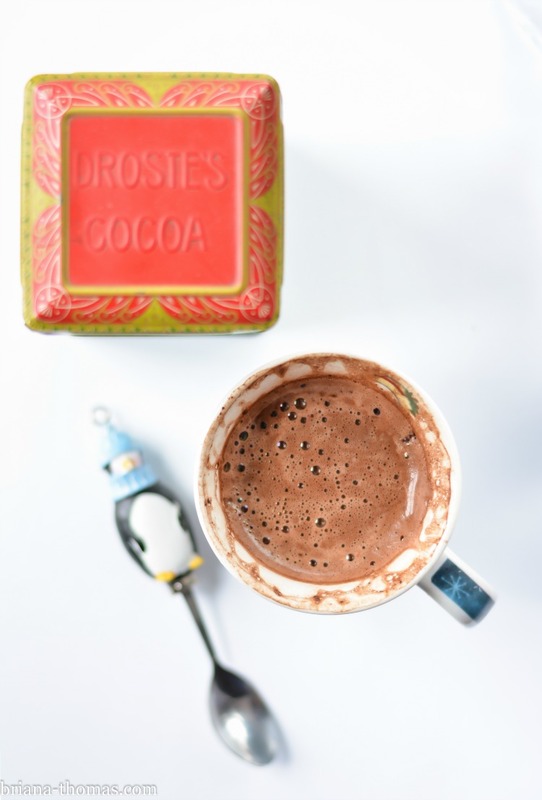 This is the third hot chocolate recipe on my website. How is this one different from the others? Well, this one doesn’t involve a blender or cottage cheese, it only takes 5 simple ingredients, and only takes about 3 minutes to make – cooking time included. Sometimes I like to add a half scoop of protein powder and some glucomannan to turn this into a more filling nighttime snack (I often leave off the cream if I do that a) so it’s Fuel Pull, and b) because the protein powder helps creamify the drink). This recipe is super-simple, but you can jazz it up as much as you like. Feel free to add protein powder (to fill you up more), glucomannan or xanthan gum (to thicken it a bit), and even flavorings. I bet a few drops of Chocolate Hazelnut flavor oil would be great in this. Stay tuned for a 5 ingredient white chocolate drink coming up soon! Want to see other 5 ingredient recipes? Click here (more recipes coming soon!). You can pin this recipe by clicking the “Pin it” button that appears when you hover over any of the pictures in this post, or you can snag my official pin here. 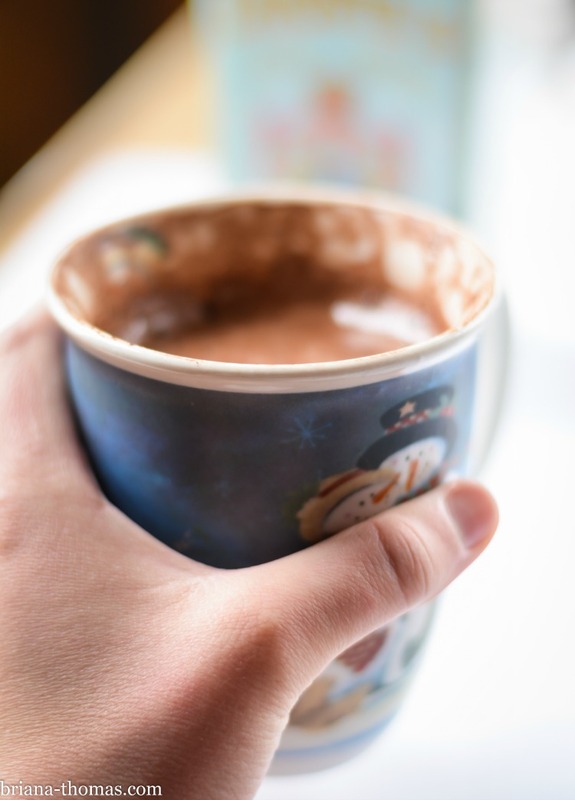 Question of the day: do you drink hot chocolate in seasons other than winter? I've found that the easiest way to do this is to put a little almond milk, the cream, cocoa, and salt in a coffee mug and whisk it together until smooth. Add more almond milk (sometimes I use some water as well because I'm frugal, but the hot chocolate isn't as creamy) to the top and microwave for about 2 minutes or a little less. You could also heat this over the stove if you have an aversion to microwaves. Whisking the whipping cream gives you a frothy end result. Add the sweetener *after* cooking (the sweetness will dissipate if you add it before-hand). I suggest starting with 2 doonks of THM Pure Stevia Extract Powder, tasting, and increasing until you're satisfied. Don't skimp on the salt: it helps round out the sweetness. I use Hershey’s Unsweetened Cocoa Powder in this recipe, as well as THM Pure Stevia Extract Powder to sweeten (you can find the sweetener at Trim Healthy Mama’s online store). I absolutely love and miss Stephen’s Hot Chocolate Raspberry mix! I’ll have to try this one with a drop of raspberry flavoring! Thanks! This was great!! I added alittle vanilla & 1/2 tsp butter… topped with whipped cream, finely ground coffee dusting… awesome!! I was like you about all the Hot chocolates, but this one is awesome. Thanks for sharing. I have been missing hot chocolate time in this cold weather. I used this recipe, minor twist, whole organic dha milk, minus heavy whipping cream, but tsp whipped cream. Is this considered an all day sipper? Thanks! No, all day sippers contain hardly any calories because you don’t want to be fueling your body all day long without a break. 🙂 (They contain mostly water, with some lemon or lime juice, tea, vinegar, stevia, and/or flavorings.) The almond milk and cream in this would keep it from being in that category. I just tried this from your cookbook and it’s magic. Love it! I used 6 oz. of milk and 2 tsp. of Super Sweet and it’s just on the edge of too sweet, but it’s absolutely perfect. I love that it takes so little time to make and doesn’t involve the blender. Yum!!! any chance you have played around with making a bulk mix like this?? 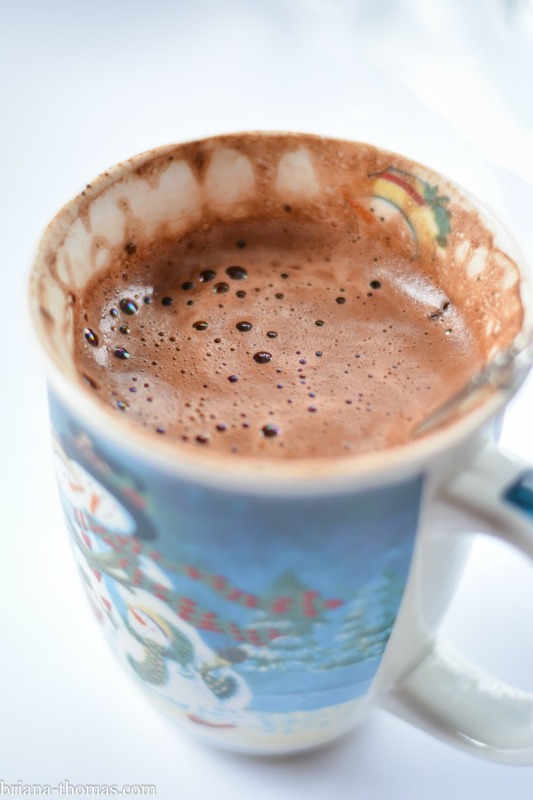 I LOVE this one, its so simple and tasty and i’ve been drinking it like crazy now that its cold, but i’d love to make it in bulk. I also wonder if you (or anyone) have tried adding in a bit of molasses? I may play with blending that up with cocoa, salt and stevia/xylitol to make a bulk mix for my whole family…. No, I haven’t tried making a bulk mix, but I’m sure you can find a mix for a similar hot chocolate if you search Pinterest. 🙂 I haven’t tried adding molasses to this recipe, but I have put it in hot chocolate before and like the results. To stay within THM guidelines, stick to 1/4 tsp. or less per serving. I just made this, used gluccie, and vanilla creme sweet drops. I added the protein powder, too. Great evening snack. I haven’t wanted to make smoothies, as winter is here. I was struggling but this opened up a new option ! Thank you! This looks great! I haven’t had hot chocolate in about a year, but I was thinking I should figure out a sugar free recipe soon. Thanks for doing the work! 🙂 One question, though: is it plenty sweet with just THM stevia extract? I’ve never had success with only stevia in chocolate recipes, because it usually leaves an aftertaste (even the THM brand), but I’d be excited if it worked in this! Well, I’m definitely not a fan of hot chocolate made with water, but you’re welcome to try that if you like. 😛 Unsweetened carton coconut milk (not the canned kind) can usually work as a sub for unsweetened almond milk, but I’ve never tried it so I don’t know how the flavor compares. Please try cashew milk, if you haven’t yet. It is the best nut milk I have found! And it should be found at most any grocery store these days with the coconut and almond milks. Brianna, I have a lot of respect and admiration for you!. I am so thrilled that you have a great love for Jesus! Then, I know I will see you in heaven someday and your blog encourages so many of us and even those who are not yet believers. I am a grandmother who homeschools her 13 year old grandson. It is hard at times, but I know this is honoring to the Lord because of the Christian values and worldview we instill in him. I listen to American Family Radio from Tupelo Mississippi every day when I get the chance. I start listening to Sandy Rios in the Morning at 7 am. Then, if I can, more in the mornings. In the early afternoon I listen to Bryan Fisher. He is so knowledgeable about world affairs and a Biblical scholar. I do not like to cook and think cooking has become gods for many. Yes, I do cook and am thankful for the money to buy the food, etc. Thanks for giving us shortcuts!! Check out American Family Radio. You will get the truth with no compromising!. I could not do without it. You can find listen to it streaming while you cook. ha. There is an app also. Blessings for all you do! Yep! That’s how I’ve made my THM hot chocolate for the last 18 months! All the other recipes I tried just didn’t cut it until I decided to add a little heavy cream. MMmmm much better!!! This I can do – thanks so much Brianna! I look forward to the other goodies you have up your sleeve! Now, if I could just persuade you to come up with a cheap and easy chocolate chip cookie . . . maybe with oat fiber . . .
You’re doing a wonderful job, just wanted to encourage you!! !